The terms ERT, RTO, RPO are used in IT’s “Business Continuity and Disaster Recovery policy”, and basically they are time characteristics (measured in seconds, hours etc.) of a disaster recovery of a data system. 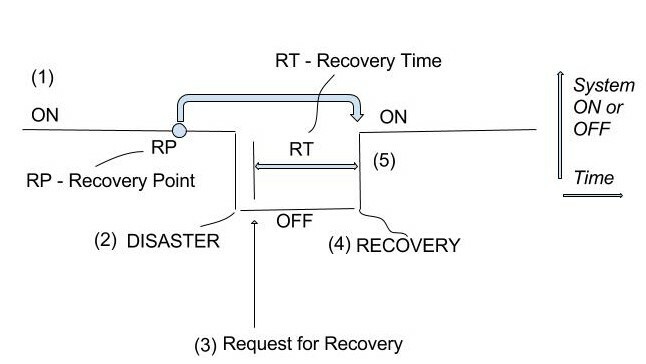 In the article RT (Recovery Time) and RP (Recovery Point) definitions are used for defining RTO, RPO, and ERT. This approach may lead to a new understanding of the terms and further discussions. A “disaster” here means an event resulting in user’s data loss and/or a period when data was unavailable. the system is “on service” again, is ON again. Often the moment of the disaster and start of the recovery are considered to start at the same time, but it is not always true. Say, a user has accidentally deleted a database, but did not notice it, and only the next day the user discovered the loss and sent to the data center a request for a recovery. In this example, there is a big gap between the moment of the disaster and start of the recovery, so these moments are not the same. We consider “Request for Recovery” and “Start of Recovery” as the same moment because the request here must start the recovery immediately, even if in reality it does not happen. RP stands for ‘Recovery Point’, and it means a moment in time. The RT and RP terms can be used and discussed separately from ERT, RTO, RPO. Recovery Point is a point-in-time from which the data system restores the data after the disaster. RT (Recovery Time) is a period of time required for a data center to resume its former condition after a request for recovery. RT is overall ‘out of service’ time interval, it can include the time for trying to fix the problem without specific recovery efforts, the recovery itself, testing, and the communication to the users. 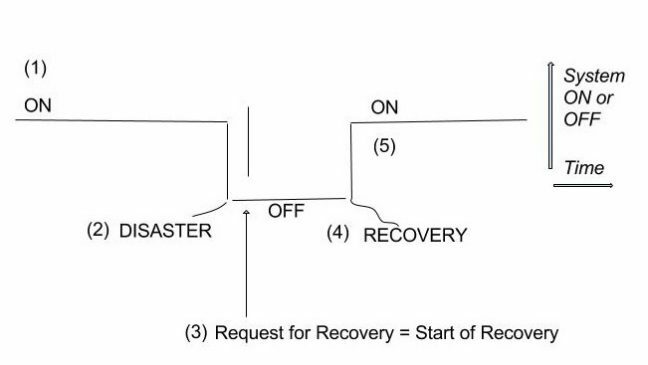 RP (Recovery Point) is a point in time from which the data center restores the data after the disaster. measured starting from the moment of the disaster, e.g., “6 seconds before the disaster”. “Astronomical” time RP is used when considering data unavailability. “Before the disaster” approach of defining RP is used when considering a data loss. Usually ERT, RTO, RPO are defined without using definitions of RT and RP, but they can be used. ERT is the estimated Recovery Time. The estimated duration for the database to be fully functional after a restore/failover request. RTO is the maximum targeted value for the Recovery Time. RPO is the maximum targeted value for the Recovery Point measured from the time of a disaster. If using RP and RT definitions it can be seen more clearly that ERT, RTO, RPO terms are about only planned and theoretical characteristics but not about actual ones. Actual values of RT and RP can be measured after actual disasters, and some averages and other statistical characteristics of the values can be calculated. Having, say, ARP (Average Recovery Point), ART (Average Recovery Time) etc. would have been very useful for data centers evaluation.